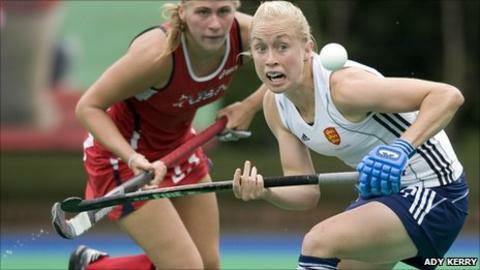 A Canterbury hockey player hopes to be chosen for the Great Britain squad for London 2012. Natalie Seymour is one of the 32 women competing for one of just 16 places in the Olympic hockey team. The women are training together on a full-time basis at Bisham Abbey National Sports Centre in Buckinghamshire. Competition is fierce but they have a common goal. "We are all pushing each other, which is great because the competition for places will only make the best team go to London and that's really what we are all aspiring to," said Seymour. "We are in an environment where we are used to selection and when you don't get selected for things it's really tough. But we have to be safe in the knowledge that the coaches are going to pick the squad that they think will win a medal in London. "While you will be disappointed, there will be a period of time when you go in and train and help the guys out that are going. It's something we work on with our psychologist." Seymour, 24, grew up in Maidstone and went to Boughton Monchelsea Primary School and then Maidstone Grammar School for Girls. From a young age, she became involved in various different sports but at the age of 13 chose to focus on hockey. The opportunity to perform at an Olympic Games at your home country - it just doesn't get any better than that. "It's just great being part of a team and the opportunities of playing a fast skilful game," she said. "Hockey combines all aspects of fitness - you've got the skill related stuff but you've also got the health-related fitness in terms of speed and you need to be strong and fit so it's really good." Seymour comes from a sporting family and has two sisters who have also been involved in sport. Her eldest sister, Louisa, used to be part of the England rugby set-up. Her family have always strongly supported her ambition to excel at her sport. She said: "I can remember days when my mum would drive me around the county to various hockey events. "When I was doing all the sports under the sun, she drove me from a netball tournament to a hockey game then back to a swimming gala in the evening." "Having that kind of support as well as the emotion support is invaluable." So how confident is Seymour that she will make it to London 2012? "You have to go into every day believing you are going to be part of that squad. Every single one of us wants to be in a team that is winning medals in London 2012. "The thought of that gives me goosebumps but right now I'm just trying to focus on those day-to-day processes. If you look too far ahead, you won't do the right thing now." The all-important selection date is towards the end of June, which seems late considering the games begin in July. But as the decision is based on performance, Seymour believes the players that form the best, balanced team at the time will be the ones to go. The team that is selected should have a good chance of bringing medal home, according to Seymour. "It's an exciting thing to be involved in and you've got the support around you of other people going through exactly the same thing and it's a great thing to share. "When the going gets tough there's always someone there to pick you up. You are making sure you are doing best for the team, not just for yourself." So, what would it mean to win a place in that Olympic team? "It would just be a dream come true. "It's been a goal of mine for so long to be part of successful international teams and the opportunity to perform at any Olympics is priceless. "But the opportunity to perform at an Olympic Games at your home country - it just doesn't get any better than that." Natalie Seymour is one of BBC Radio Kent's three featured athletes as part of 'Olympic Dreams' in the build-up to London 2012.